You’ve said yes to the dress … now what? You Have The Perfect Dress, Now Get The Perfect Fit! ! Unless you are one of those lucky ladies who never have trouble finding items that fit you perfectly straight off the rack, there’s a good chance your bridal attire will require alterations. But don’t worry. Rest assured that with Maria your garment is in good hands. With 30 years of experience and countless complex reworking of fabrics, opening up seams, adding sleeves, accessories, embellishments, changing necklines and performing countless of sewing tasks from boning to hems and bustles, she can practically redesign a dress. So, when you’re ready just schedule an appointment. For your first visit and all subsequent fittings please bring any shaping undergarments (slips, bustier, etc. ), shoes, and hair accessory or veil you will be using. With all of the pieces in place, it will be easier for you to envision the overall wedding day look. 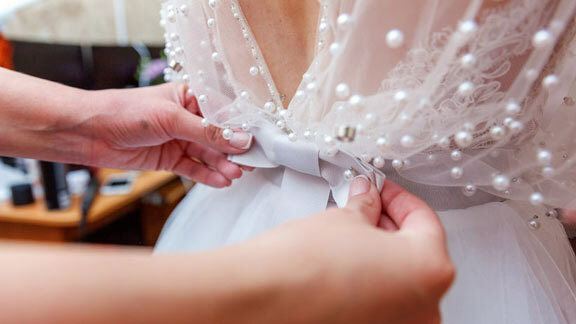 Making just one aspect of your wedding day that much easier and extremely memorable is our business at Maria Alterations.